There are few companies more American than Mack Trucks. With their big, recognizable trucks and bulldog mascot, Mack was been producing the commercial vehicles that provide the backbone of American commerce since they were founded on June 11, 1900. The AB was a model introduced in 1914 and produced through 1937. Over 55,000 were produced in varying configurations over the course of the production run. This one has a fairly lengthy wheelbase and a stake bed for hauling lumber. All that mass is moved by a 30 horsepower four-cylinder engine. Top speed is probably minimal, which is good because this truck features only mechanical rear drum brakes. This stylish C-Cab truck has been well restored and is coming out of long-term ownership. The engine has been freshly rebuilt, making this the perfectly impractical vehicle for your Home Depot 2×4 runs. It should sell for between $15,000-$25,000. Classic commercial vehicles are always interesting, so grab this one while you can. Click here for more info and here for more from this sale. 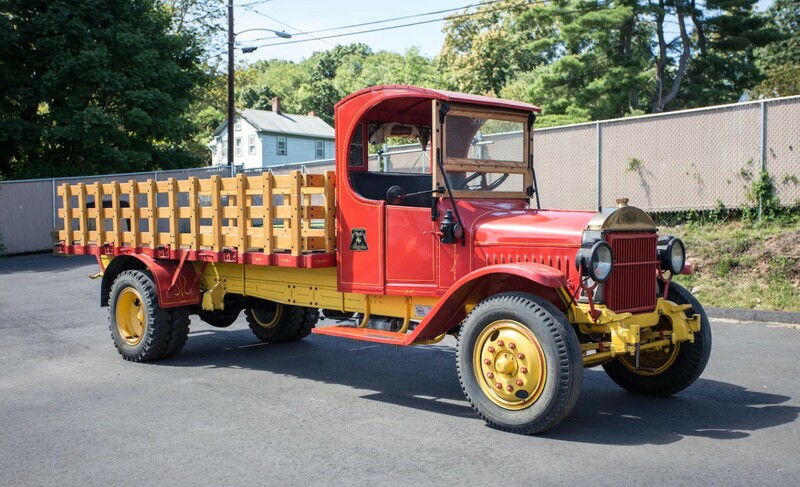 This entry was posted in Uncategorized and tagged 1917, ab, auctions, Bonhams, c-cab, classic trucks, commercial vehicles, mack, stake bed, truck by classiccarweekly. Bookmark the permalink.